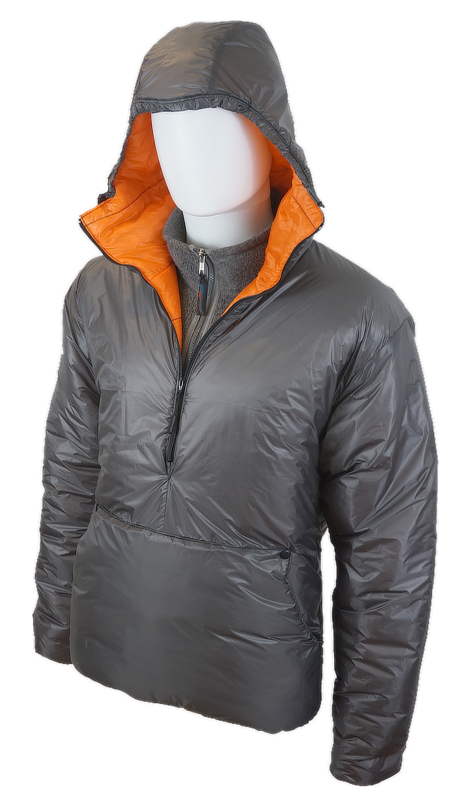 Synthetic insulation and ultralight materials in a pullover or jacket style shell. Extensive sizing and feature set available. Plain Open Type Sleeve FinishLycra stretch banding, fixed length. Compared to its down counterpart the Skaha APEX can be worn more effectively during exertion since perspiration barely affects the fill. The Skaha design is optimized for backpacking. The cut is roomy for layering up; a feature that also allow it to be slipped on quickly without bunching or catching. 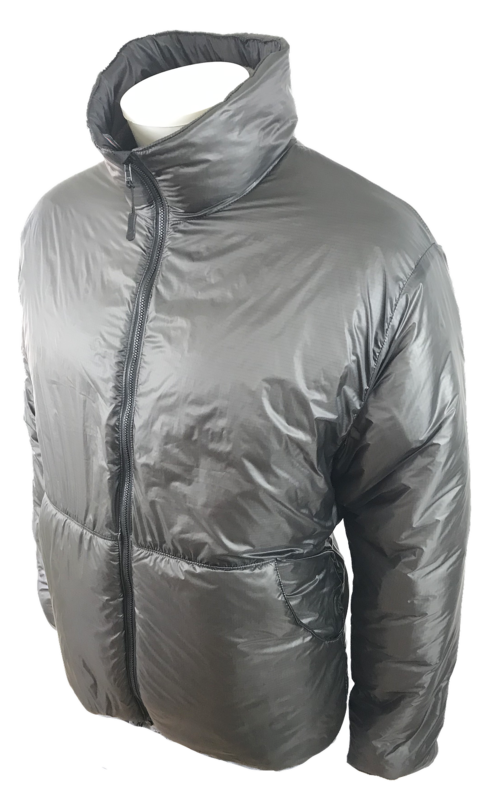 The generously sized zipper-less front pocket(s) is ideal for hand warming either at camp or while hiking; and roomy enough for a headlamp and gloves besides your hands. At night the Skaha APEX can serve double duty boosting the temperature rating of your ultralight quilt, thus saving on weight otherwise invested in redundant insulation. With the optional hood, this jacket is especially handy in this way. We build the Skaha with simplicity as the overriding design parameter. In its standard configuration it has no extras, zero bells and whistles, nothing to snag or break or get in the way of traveling light and fast. 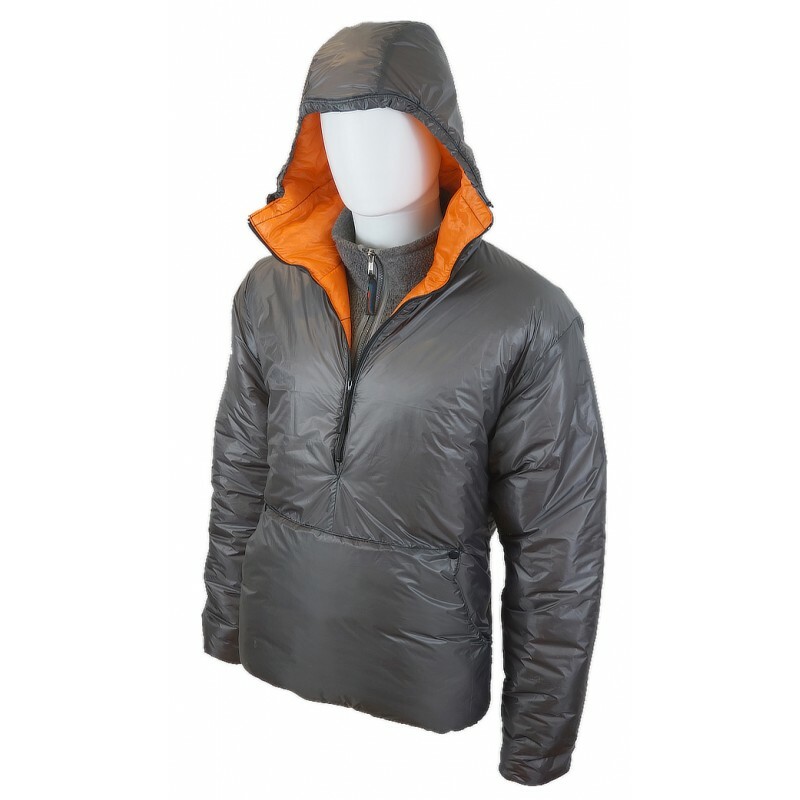 What you do get is maximum warmth for the given weight, and a clean looking, functional garment. The standard front closure is a YKK #3 coil pullover style half zipper. The half zipper, without the complexity of a separating mechanism, has proven to be very long lasting. An optional full length jacket style separating #3 toothed zipper is available in the menu below. 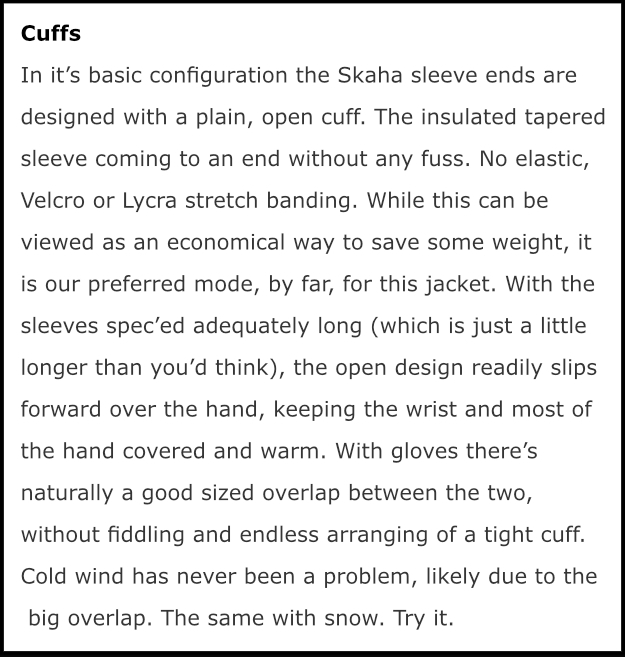 The Skaha APEX include the hand warmer 'muff' style exterior pocket. In the pullover version it's one large kangaroo pocket; while the full zip jacket has the same style pocket but split in two by the zipper. We make the Skaha with two choices of collars or a hood, all insulated. Standard is a regular 2.5" tall collar. The nearly 5" tall Super Collar is a cozy in-betweener that saves a little weight and bulk over a full hood, but still insulates areas a wool beanie won't reach effectively . The Hoodie version features an integrated standard sized insulated hood, however, not readily helmet compatible. Hood and bottom hem are controlled by a shock cord and adjusted with a toggle. APEX by Climashield, a superior continuous filament synthetic insulation, is the choice here. We have 3 weights available, from light (less warm) to heaviest (warm, but bulky). It's hard to attach a temperature rating to each, however we feel the most efficient balance of weight and warmth for 2-3 season mountain use in the continental US (and the Alps) is the 2.5 oz/yd. Folks who easily get cold might disagree, and for you we have 3.6 and even 5.0. We also offer a few variable applications of fill. The option is to go down one or more levels for the sleeves and hood if the 3.6 or 5.0 is chosen. This will reduce weight and bulk in a fashion that makes sense: more insulation for the core, less for appendages. Either way, the front pocket, if chosen, will always be 2.5 oz. NB: The 5.0 is not available for sleeves, due to bulk. The Skaha APEX can be configured with 3 different shell choices, each in a limited number of colors. These are ultralight fabrics for folks who want the lightest, but realize that abrasion and tear resistance is minimal. Suitable for hiking/backpacking; less so for climbing, ski-mo and mountaineering. At this point we can offer more durable fabrics on a special order basis only. These include Epic and multi-cam. Please email or call. *Pertex Quantum, 15d. This is a ripstop weave with a little more tear strength compared to the 10d, yet about the same effective breathability. Some resistance to mist via a factory DWR coating (Durable Water Repellant), although these applications are of variable life span. Black, Sage Green. *Robic Ripstop. A special material based on an ultralight, yet relatively durable 7D base fabric with a breathable micro porous coating. Altogether the total weight ends at a respectable 0.74 oz/yd. The Robic is useful at shedding water with a HH (hydrostatic head) of 1000mm, while providing enough vapor transfer for mild activities (good breathability). Bright Blue, Black, Dark Olive and Dark Grey. 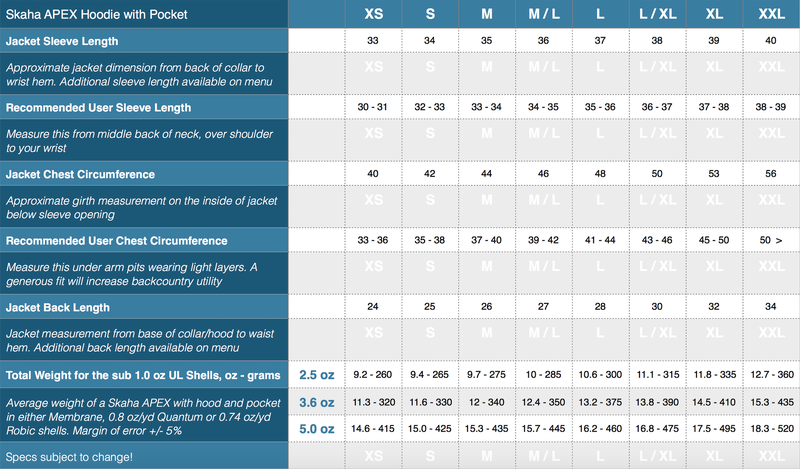 The chart below outlines the many options for sizing the Skaha APEX. The cut is generally aimed at providing a roomy fit, easily accommodating layering and backcountry utility. If you desire a tighter, city-centric look, go down a size! If you choose the bulkier, warmer 5.0 oz/yd fill - expect a less roomy fit. Either way, since these are built to order we saw no reason to limit the choices. 8 general sizes can be combined with custom 4 each sleeve and back lengths. Have at it! Shell fabrics pictured, left to right: 10d Moroccan blue, 7d Dark Grey, 10d Grey. The right most jacket is the full zip version. Please visit the Fabric Page for more details regarding these choices. I just received my Large Skaha. Im 5'11 and weigh 180. It is well made and the sizing was great. Perfect for my backcountry fly fishing trips. I couldn't have asked for better customer support while deciding on various options and I am so glad I ordered a semi custom jacket rather than going with an off the shelf jacket. 122 g/m in the body. I planned this to be good for camp chores to a few degrees under 0C and a bit beyond if need be. So far it has coped easily. Wee bit over 320 grams. Elegant in design. Succeeds as planned. Since my first review I have used my Skaha APEX jacket for about 6 months and it is awesome. On windy nights photographing the moon in 25f, around base camp in 18-30f even the occasional walk short walk when snowing. It has always kept me warm and snug. Thanks again for a truly great jacket. Body length is good, not being too short, and the cuffs don't ride up when raising my arms. The 13" zip makes it easy to get on and off. Elasticated hem which keeps the drafts out, could do with an elasticated collar to stop heat escaping. Climashield APEX 5oz filling is a little bulky like most Four season synthetic tops, having said that it fits well over my base layer and not that bulky under my waterproof jacket. The outer shell is Grey Robic Ripstop fabric with a breathable micro porous coating. The Robic is useful at shedding water with a HH (hydrostatic head) of 1000mm, while providing enough vapour transfer for mild activities (good breathability). The inner material black taffeta and this is where the insulation is stitched in. This is the lightest version of the pullover style jacket, with the medium weighing 353g, 12.5oz. You can of course specify the fill, back length, collar, pockets, hood and several other features. I used this jacket on a recent overnight trip on the North Yorkshire Moors. Windy at 15-20mph and gusting 30mph with hill fog rolling in. Around camp I was warm and dry and when I turned in for the night I left the top on over my base layer under my quilt. It soon became too hot so removed & added to my stuff sack pillow. Unfortunately, the temperature did not drop below 37f overnight, so the jacket did not reach its full winter status. Will be submitted to further use as winter draws on and the temperature drops. Really impressed with it, very well made and the fit seems spot on, everything I wanted and nothing more. Thanks so much for getting it to me in time for my Arctic Sweden trip. I got the the 5.0 Apex and It is so lofty yet so light! Superb quality, looks great, feels great. Special thanks to Jan for working with me on some custom details- I really appreciate it! 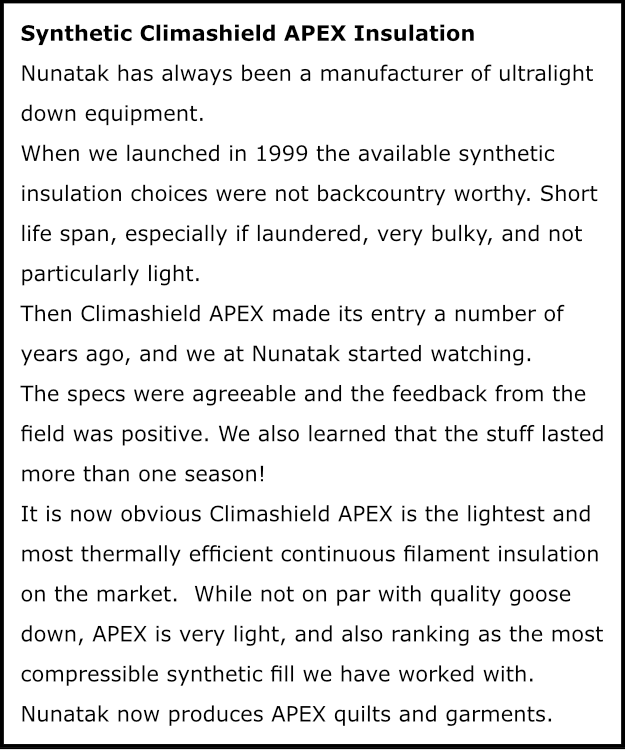 Look forward to ordering from Nunatak in the future they are a first class operation. Just letting you know the jacket arrived today with two weeks to spare before my trip!. I am absolutely thrilled with the result. It's a beautiful, warm jacket and the finished weight came in at only a hair over 400g!! I'm hoping to do a little write up for backpacking light when I get a chance. Please pass on my thanks to the team. Superb work! Received the jacket yesterday- looks great! 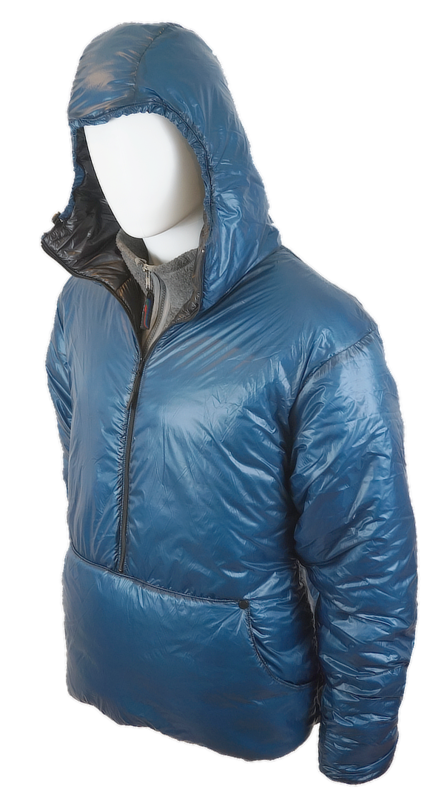 I was surprised (pleasantly) how much loft the 2.5 Apex has- wow :) I'm hoping to bag Stuart Peak tomorrow, the jacket will accompany me. The Pullover Style features a half length front zipper, and weighs 10-15 grams less. Adds a number of inches to the torso length of the selected general size. No Extra Length Add 1" Add 2" Add 4" Add 6"
For folks with long arms, or skinny torsos. No Extra Length Add 1" Add 2" Add 3" Add 4"
The level and/or combination of insulation values. The lightest in weight offers the least warmth, etc. Take note that the 5.0 level can feel a little stiff (not available for pants). Please see our Fabric Page for help choosing the right shell material. 10d for ultralight priority, or 15d bright orange Pertex Quantum for safety visibility when inside out. Choose how to finish out the head opening. Getting an integrated hood eliminates all collars. This option adds a double sided entry hand warmer 'muff' centered below the pullover zipper. Omit for a 25 gram weight saving. With a vertical opening hidden behind the main front zipper, these pockets are protected yet easily accessed. The pockets adds 16 grams in size large. Plain Open Type Sleeve Finish Lycra stretch banding, fixed length.